Many readers drawn into the heroic tales of J. R. R. Tolkien's imaginary world of Middle-earth have given little conscious thought to the importance of the land itself in his stories or to the vital roles played by the flora and fauna of that land. As a result, The Hobbit, The Lord of the Rings, and The Silmarillion are rarely considered to be works of environmental literature or mentioned together with such authors as John Muir, Rachel Carson, or Aldo Leopold. Tolkien's works do not express an activist agenda; instead, his environmentalism is expressed in the form of literary fiction. Nonetheless, Tolkien's vision of nature is as passionate and has had as profound an influence on his readers as that of many contemporary environmental writers. The burgeoning field of agrarianism provides new insights into Tolkien's view of the natural world and environmental responsibility. In Ents, Elves, and Eriador, Matthew Dickerson and Jonathan Evans show how Tolkien anticipated some of the tenets of modern environmentalism in the imagined world of Middle-earth and the races with which it is peopled. The philosophical foundations that define Tolkien's environmentalism, as well as the practical outworking of these philosophies, are found throughout his work. Agrarianism is evident in the pastoral lifestyle and sustainable agriculture of the Hobbits, as they harmoniously cultivate the land for food and goods. The Elves practice aesthetic, sustainable horticulture as they shape their forest environs into an elaborate garden. To complete Tolkien's vision, the Ents of Fangorn Forest represent what Dickerson and Evans label feraculture, which seeks to preserve wilderness in its natural form. Unlike the Entwives, who are described as cultivating food in tame gardens, the Ents risk eventual extinction for their beliefs. These ecological philosophies reflect an aspect of Christian stewardship rooted in Tolkien's Catholic faith. Dickerson and Evans define it as "stewardship of the kind modeled by Gandalf," a stewardship that nurtures the land rather than exploiting its life-sustaining capacities to the point of exhaustion. Gandalfian stewardship is at odds with the forces of greed exemplified by Sauron and Saruman, who, with their lust for power, ruin the land they inhabit, serving as a dire warning of what comes to pass when stewardly care is corrupted or ignored. Dickerson and Evans examine Tolkien's major works as well as his lesser-known stories and essays, comparing his writing to that of the most important naturalists of the past century. 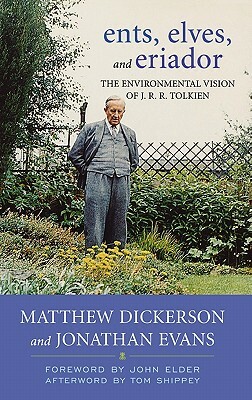 A vital contribution to environmental literature and an essential addition to Tolkien scholarship, Ents, Elves, and Eriador offers both Tolkien fans and environmentalists an understanding of Middle-earth that has profound implications for environmental stewardship in the present and the future of our own world. Matthew Dickerson, professor and member of the environmental studies program at Middlebury College, is the author or coauthor of several books, including Following Gandalf: Epic Battles and Moral Victory in the Lord of the Rings and From Homer to Harry Potter: A Handbook on Myth and Fantasy. Jonathan Evans, associate professor of English and director of the medieval studies program at the University of Georgia, is a member of the Environmental Ethics Certificate Program faculty. His essays on J. R. R. Tolkien have been published in J. R. R. Tolkien and His Literary Resonances, Tolkien the Medievalist, and The J. R. R. Tolkien Encyclopedia.